I'm very pleased with my Tau army so far. But that doesn't mean the Tau army is finished. Far from it. I'm planning to expand the army with some new Tau Battlesuits, a specially converted Devilfish for my Pathfinders and another Tau Battlesuit command team. Probably another Tau Battlesuit commander or team leader armed with and Air Bursting Fragmentation Projector as well. I'm yet to take the Stealth Suits out in large numbers again and as someone who believes that Kroot are best used for fodder, I don't plan to buy any more Kroot. While I have heard of Kroot hordes running rampant, I think the age of not knowing how to deal with units in cover is going to come to an abrupt end rather soon. I have 10 Kroot in larger games who occupy a wood and mostly go to ground for the purpose of irritation and absorbing firepower while providing a tactical counter charge element. But at the same I don't care if they all die screaming (a common occurence) as they only cost 70 points. So More of the Same? 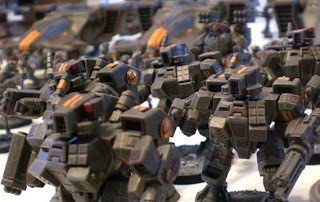 More Tau Battlesuits; that's without question. I've enjoyed real success with the Tau Battlesuit Shas'el commander and Battlesuit bodyguard armed with plasma rifle, missile pod, multitracker and targeting arrays. The whole unit hitting on 3+ is quite devastating, especially when combined with a markerlight from my Skyray. So naturally I'd like another as my second HQ choice. In the meantime, the Tau Battlesuit team with twin linked flamers and missile pods has performed exceptionally well up close, but suffered at long range. Either way, they're very scary and deter people from getting close. However, I would like to try another combo of twin linked missile pods and single flamers to see how that fairs. A Tau Battlesuit armed with the Air Bursting Fragmentation Projector seems essential for when I can't get my flame units close enough. Usually people field this guy with twin linked missile pods, but I have seen one guy give him twin linked flamers. Both options may be worth investing in, especially if I need massed flamers on both flanks. Finally, I'm thiking of converting another Tau Battlesuit commander equipied with the usual plasma rifle and missile pod, but with Iridium armour and 2 shield drones, giving both him and his drones a 2+ save, then joining him to an existing Battlesuit Command team...but that's a lot of points in just one unit! While the 'El commander and bodyguard are a deadly unit, you might want to try the five Battlesuit unit for a game or two. Two 'El commanders attached to a unit of three battlesuits. With minor markerlight support (I take a Skyray) you have a unit that can shoot just about anything to death and assault the remains. Add shield drones and you can run around in front of Leman Russes for five Turns. Expensive, but brutal. I'm interested in seeing what you do with the Pathfinder Devilfish. and 2 broadsides with advanced stabilization and 2 shield drones. I was thinking about beefing up my pathfinder squads to 6 or even 8 members each, adding a hammerhead, broadside and/or skyray, a piranha, or more crisis suits with missile pods and plasma rifles. I've also been toying with the idea of a shas'el commander with the airbursting fragmentation projector, cyclic ion blaster, targeting array, multi tracker, and 2 shield drones. I think he would be a fun unit to have and would be good at dealing with horde armies without having to get so dangerously close to them as is required by a flamer. He would most likely be deep striked in. I was also considering giving the positional relay to my commander so i can better dictate when my units will come in. The fact that i have 2 pathfinder devilfish that allow me to reroll the scatter dice for deep striking units makes this all the more useful. Anyone have any success with or thoughts on these units? I had a ton of success (in 4th, so it may not apply anymore) using TL-missile pods and a targeting array on a suit. Two STR7 shots that are more or less guaranteed to hit per suit was very potent. 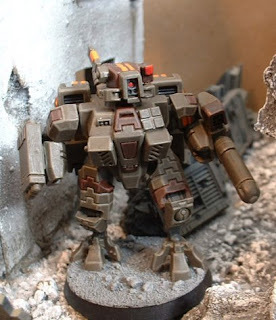 I have been a fan of your army since I first saw it on Advanced Tau Tactica (where I go by Shattered Spear) and I am glad you are expanding your army. I think you should go for the TL MP squad with single flamers (hard-wired multitarackers of course if an HQ squad)and give on a ABFP instead of a flamer. I think this will give you stregnth and versitility at every range within 36"
Keep up the good work and I look forward to seeing what comes of your expansion. well honestly you can't go wrong with more suits, but why not just build a magnetized set, so you can swap out weapon builds? Can somebody out there post a link for us? That would be awesome. Also, what size mags to get? Deathrain battlesuits (tl-mp) are awesome at putting a stop on all those marines driving rhinos around. Some players give them a targeting array to guarantee hits but I don't see that as necessary. I prefer giving them flamers for some versatility. I'm also interested in seeing what you can come up with for Pathfinder devilfish. give your commander both special weapon systems, there amazing against everything but tanks. special issue allows you to take both, but only one of EACH.